I’m scrutinizing every step I take. Hissing and bubbling can be heard from either side of me. Boiling pools of water liberate white steam into the air. I hesitate momentarily to cross the shallow stream twenty feet wide, but following Claire is reassuring. There is a reason the area we are hiking through is known as Porcelain Basin (in Norris Geyser Basin). A misstep could boil a foot, a leg, or the human body in its entirety. Snow-free, warm to the touch, and composed of a myriad of colors, the landscape here is surreal and mesmerizing; more like a Martian planet than anything. It could be a setting for the land of Mordor in the Lord of the Rings. Or it could be a picture of hell. Claire has taken this route countless times, and she can’t help but express how amazing (and dangerous) this place is. This is where the intensive, monthly bison survey has taken us, as we attempt to find and count every bison in the study area. The Norris Geyser Basin has historically been a favorite hangout for the bison, especially for the older bison that come to this mystical place to die. Claire says she wants to come here to die when she gets old too. Not a bad idea, I think to myself. Even with its abnormal characteristics, the place is calm, quiet, relaxing, and almost entrancing. Include the complimentary seat heaters and it’s a dandy place to lay your old bones down to rest. But, to our dismay, we find no bison. 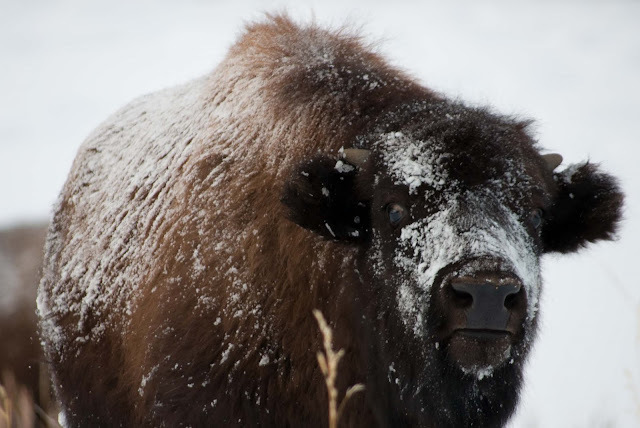 It seems there has been an abnormally low number of bison in the study area this year. Maybe the snows haven’t pushed the big herds out of the Hayden and Pelican Valleys yet. At the end of the day, we are all exhausted; the kind of exhausted where if you sit down, you probably won’t stand up again until the morning. We had trudged miles through deep snow, sometimes not getting back to the snowmobile until after dark had fallen. All that exertion for about 80 total bison in the study area (a low number; several months from now, I will be reporting many, many more)…and totally worth it. We thoroughly enjoy having Claire visit and help out on the research. 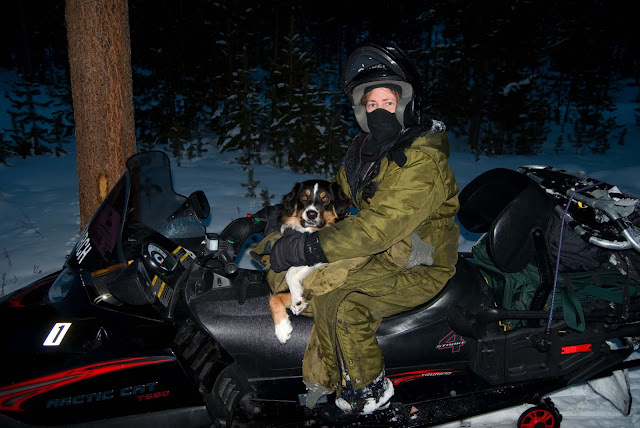 Not only does she provide much needed insight, knowledge, and labor, but she also cooks us great meals (from a white-tail deer buck she shot) and provides us with canine entertainment (since she just trained her dog to ride the snowmobile into the park). I hardly know Claire, but she has been extremely encouraging to me regarding the path and choices I have made (and should make) in becoming an ecologist. She has significantly altered my immediate future and allayed many of my fears, which I will blog about at another date (after all, this is an aspiring ecologist blog!). Tonight, I set off on another semi-nightly solo ski venture. My fear of large lurking mammals in the dark abates every time I go out, allowing me to wander much more freely through the lightless trees. I do not like using my headlamp, as it envelopes me in a small, narrow world, my eyes only capable of seeing what’s in the beam of light; but with the moon only as a sliver and covered by clouds, I must use it to see anything at all. After crossing the Gibbon bridge, I come across the first signature of the night. The cluster of four tracks belonging to the snowshoe hare resembles the Big Dipper to me. I lay my ski pole between two “Big Dipper” tracks; the hare’s average bound is longer. Continuing up stream, I drop down a short hill and quickly set upon a new name in the snow. It is the largest scrawl in the park, left by the largest mammal in the park. A bull bison has slowly lumbered along without any intention of going in a straight line. Every twenty feet or so he has used his huge hump muscles to throw his head back and forth, pushing aside the snow, hoping to find his buried meal. Being the big bull that he is, he decides to decapitate a young lodgepole pine tree, leaving the top of the tree two feet away as evidence for the atrocity. I cross a small stream with an awkward leap, barely catching my balance with my poles on the opposite side. One of the surname Canis lupus has scribbled his autograph along the river bank. He has followed proper wolf tradition and traveled in a straight line, only occasionally turning to the side to sniff at the air before continuing onward. These tracks will lead me to the destination I desire, but I have not yet read all the snowy inscriptions. Pointing my dim headlamp towards the river I spy a strange track I have not seen or admired before. 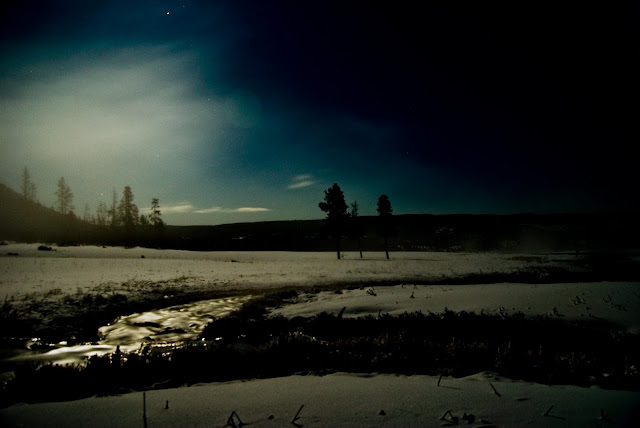 It appears at the rim of the bank, draws a large horseshoe in the snow, and disappears back into the water. This track is much different than the others; instead of consistent, predictable paw placement, the track is composed mainly of a long slide…much like a belly-bound penguin pushing across the snow. It could be none other than the river otter, taking a quick break from its aquatic world to leave its message in the snow. It reads well for me. I am now paralleling the wolf tracks, angling up the slope away from the river. Converging into the wolf tracks, miniature wolf tracks appear, giving clear representation of the coyote. I know I am near now. Squinting my eyes to see beyond my light, I search for one last insignia in the snow. Up ahead on the side of the white slope, I see a large, dark blob. I yell into the night, making sure to enunciate so not to be misunderstood, “hey …if there’s anyone out there…this is my carcass now! Ya’ll better clear out ya hear? !” I listened intently for an answer, but there is none. I knew there wouldn’t be, for the kill had been made several days earlier and had been nearly completely consumed. All that remained of the young elk was a few legs with attached hoofs and a frozen hide. After examination, I pocket a hoof and head back along my own linear signature leading back to the cabin. Needless to say, my coworker Megan wasn’t too thrilled about her early Christmas present from me tonight. I love looking at your pictures that you are taking!